Sybil Goldberg Arguijo Scholarship | GAAMHA, Inc.
GAAMHA announces selection of the first annual Sybil Goldberg Arguijo Scholarship award recipient. July 2, 2014 Gardner, MA – GAAMHA Inc. is proud to have selected Diane Mascitti as the first recipient of the Sybil Goldberg Arguijo Scholarship award. This $1000 award will go towards tuition and other school related costs to a student in their second year of study pursuing a degree in Human Services at Mount Wachusett Community College. 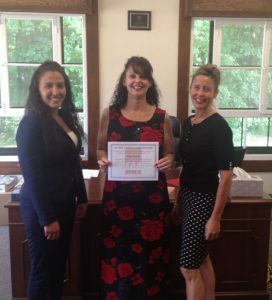 Presenting the award pictured L-R Tracy Hutchinson, CEO GAAMHA Inc, Diane Mascitti, Carla Zottoli Defosse, Executive Director, MWCC Foundation Inc .